A country covered in road signs you can’t read, inhabited by people speaking a language you don’t understand may not seem like the ideal spot to wing it on a bike tour. 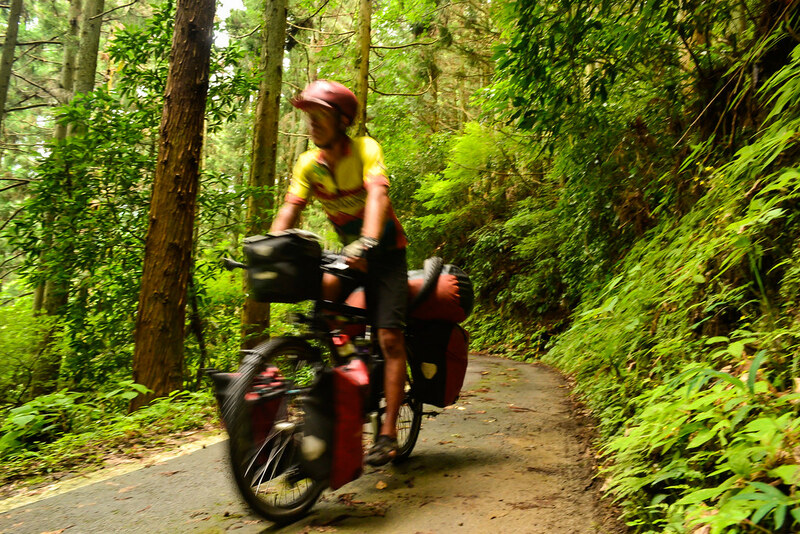 No, Japan is ordinarily a place cyclist travel to armed to the hilt with information. Some Über-cyclists might spend weeks hunched over a computer meticulously planning their route. Others will splash out on some fancy translation tools, pack a smartphone and load up the GPS with navigation info. At a minimum, any sensible cyclist would surely, SURELY cram a bilingual map into his panniers. No right-minded individual would attempt to navigate via compass all the way to Tokyo. Yes, COMPASS. No, clearly that’s NOT a sensible approach. Unfortunately, that’s exactly the plan my dear husband conjured up. His back-up strategy consisted of dashing into7-11’s and consulting the Japanese language only road maps. Hmn, that looks like the sign for Shizuoka, yeah that’s it…a lot of squiggly lines and then a y shape in a box. OK, we’re on track , don’t worry. We need to be going north east and according to the compass we’re headed the right way. I think route 82 will get us over these mountains and then I’m sure it’s a clear shot to the coast. Trust me, we’re gonna get to Tokyo tomorrow. It’s a recipe for disaster, right? Well, yes. I can’t deny a few near meltdowns mid-tunnel as traffic roared past and we squeezed through on the narrow pedestrian walkway. I’m certain we did a few extra loops and ended up in the exact spot we started. But all in all the compass strategy lead to some fabulous scenery, memorable encounters and amazing camping spots. After receiving a package in Tokyo, we’re all mapped up and ready to roll toward Hokkaido. We may even manage to decipher the complexities of navigating via GPS. Following our trusty compass was an adventurous way to track down Tokyo, but that kind of experience is best lived just once. Jam-packed Tokyo comes as something of a shock. We’re indulging in ex-pat luxury (thanks to a former work colleague in Germany) near Shibuya crossing in the heart of the city. Tomorrow it will be back to the road and the life we’ve grown accustomed to. This is a section of beautiful Route 82. We stumbled on it quite accidentally. The road climbed higher and higher into the thick forest and got so narrow I don’t know how two vehicles could possibly pass. 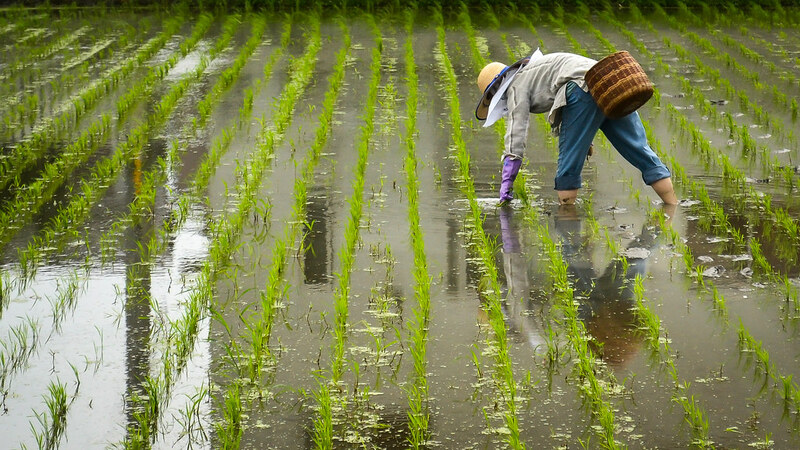 We were surprised to see so much traditional rice farming in Japan. Open land is often taken up by paddies tended to by retired people. Apparently taxes are lower on agricultural land so instead of planting some nice green grass, people tend to plant crops. Large yards such as you find in the US or Australia are virtually unheard of. This old timer was busy digging up potatoes and gladly posed for a portrait. 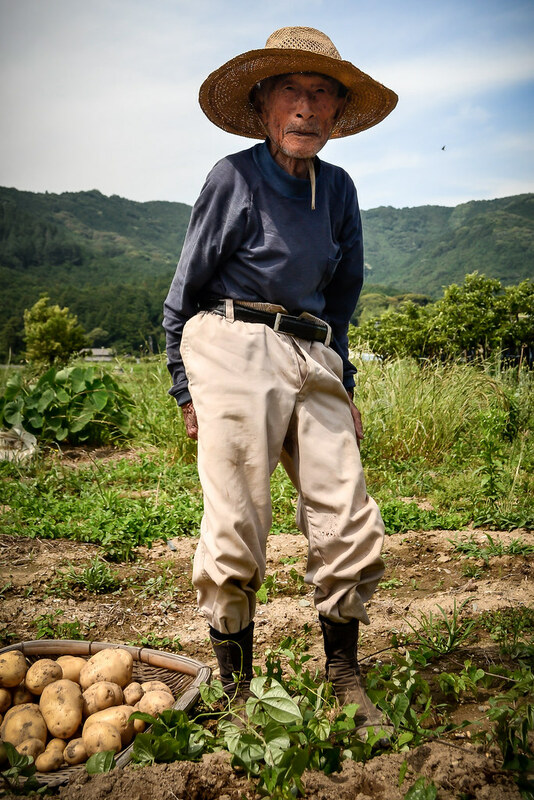 Japanese are keen gardeners, perhaps that’s why they live so long. Just around dusk one evening we found ourselves cycling through a densely packed corridor of homes and business. We spotted an orchard and asked to camp. In the morning the owner of the land brought us a hot pot of coffee and some snacks. 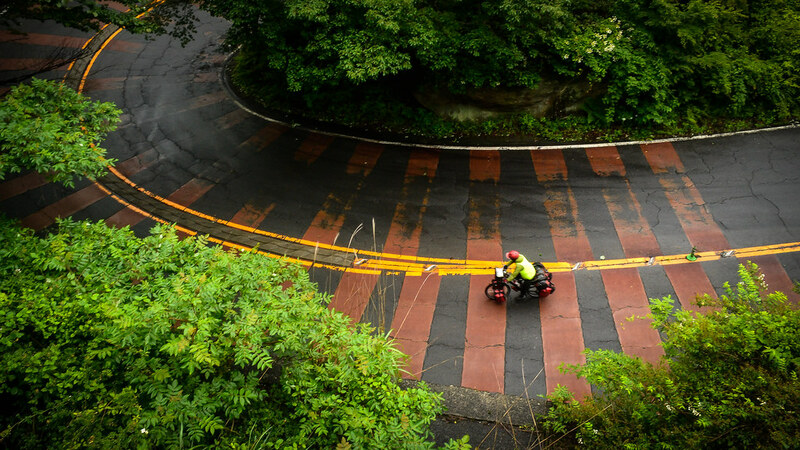 Around 120 kilometers outside of Tokyo we were surprised by a climb that went on forever. Our hopes of reaching Tokyo that day were dashed and we slogged out through heavy fog and drizzle with near zero visibility. Finally the weather cleared and we were able to enjoy the switchback descent. 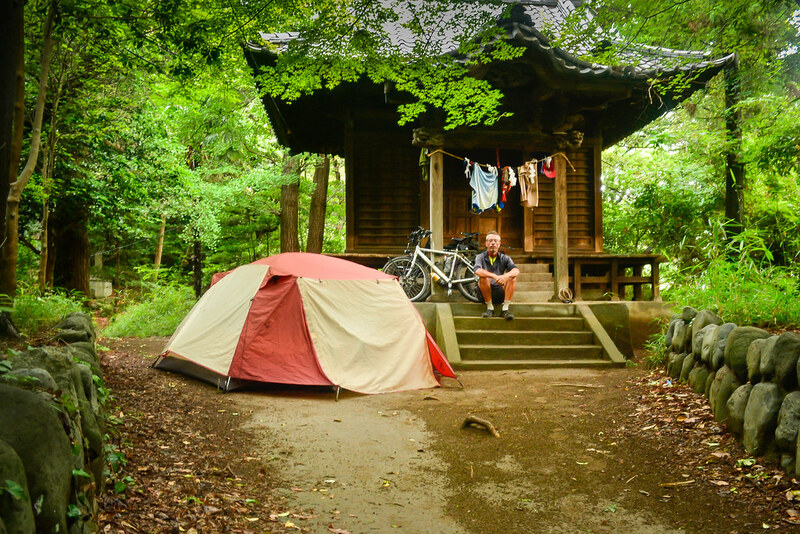 Just 50 kilometers from the center of Tokyo we found this peaceful camping spot. This small temple is in a busy residential neighborhood of tower blocks and an expressway runs alongside about 500 meters away. Japan is full of tranquil hideaways like this. 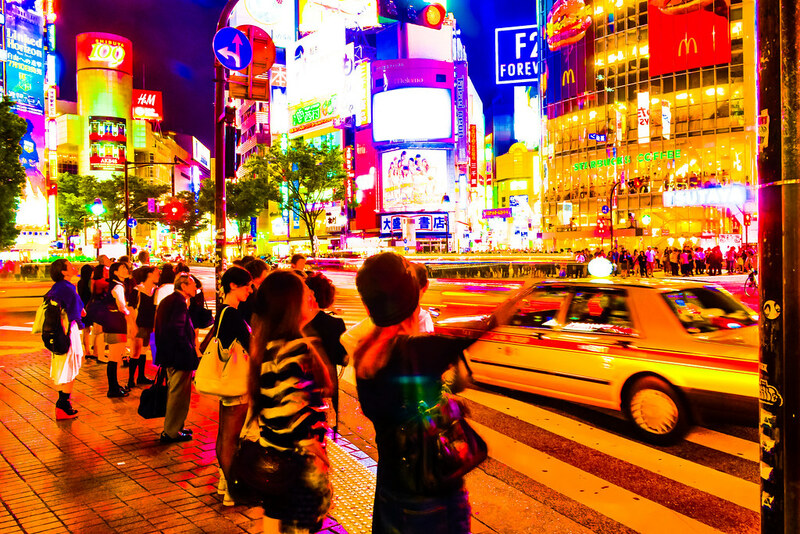 The bright lights and intoxicating atmosphere of Shibuya crossing. We’re staying in a quiet spot just 10 minutes from all this excitement.